Researchers from Brunei, Austria and Thailand have discovered a new species of ant, dubbed Colobopsis explodens, in the rainforests of Borneo and their findings were published on 19 April 2018 in the journal ZooKeys. Ahmad Fadillah Sellahhuddin from Brunei, who works to support underprivileged families in his community, received a Queen’s Young Leaders award at a ceremony held at the Buckingham Palace, in London on 26 June 2018. Maziah Mahusin became Brunei's first female Olympian at the London Summer Olympic that officially kicked off on 27 July 2012. The 19-year-old Mahusin achieved the honor to compete in the women’s 400 metres hurdles. Brunei was admitted as member of the United Nations (UN) on 21 September 1984. Ibrahim Bin Hj Md Yussop of Brunei won the third prize at the 2016 World Food Day Poster Contest in the 13-19-years-old age category for a poster with the theme "Adapt to change." Sultan of Brunei and Prime Minister of Malaysia on 8 December 2013 officially opened a bridge at the Malaysia-Brunei common border. 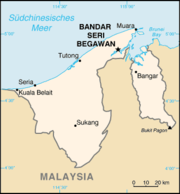 The bridge linking Temburong, Brunei, and Limbang, Sarawak, Malaysia is expected to facilitate trade, tourism and cut travel time between nations. This page was last edited on 15 April 2019, at 23:31.